Sharp has this week unveiled a new TV prototype with 16 times the resolutions of a HDTV, roughly the same as IMAX with 7,680×4,320 pixels or 103 pixels per inch. 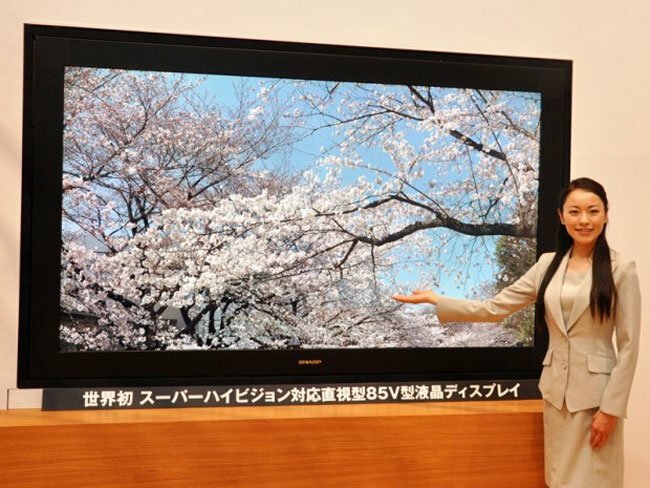 The new format is now known as Ultra HDTV or Super Hi-Vision and was showcased by Sharp Sharp in cooperation with Japanese national TV broadcaster NHK. Watch a video of the new Ultra HDTV after the jump. NHK has been working on the new Ultra HD resolution for some time, but its still not expected to arrive in a commercial form until 2020 when NHK plans to start trial broadcasts. Although there maybe a possibility of some demonstrations happening during the 2012 Olympics. This LCD will be shown to the public at NHK’s Science & Technology Research Laboratories in Tokyo from May 26th to 29th, 2011. Have a look at our article on the difference between LCD and LED TV’s and also read our handy OLED TV Explained guide for more information on the latest HDTV’s.